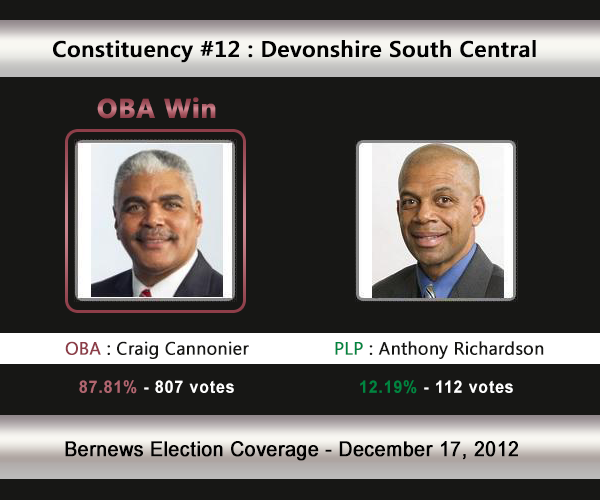 [UPDATE Dec 17: Election Results] Opposition Leader Craig Cannonier [OBA] has retained his seat against Anthony Richardson [PLP] in Devonshire South Central. Devonshire South Central — widely considered one of the ‘safer seats’ for the Opposition — will see One Bermuda Alliance Leader Craig Cannonier challenged by the PLP’s Anthony Richardson. Makai Dickerson stepped down as the PLP candidate following news that he was caught with a small amount of cannabis, and was then replaced by Anthony Richardson. Mr Cannonier is the incumbent, having won a 2011 bye-election with 82.89% of the vote after former MP John Barritt stepped down. In the 2007 General Election, Mr Barritt [running under the UBP] won 85.26% of the vote vs the PLP’s Linda Merritt [723-122]. In 2003, Mr Barritt won with 90% of the vote against Aurelia Burch [PLP] who received 10%. 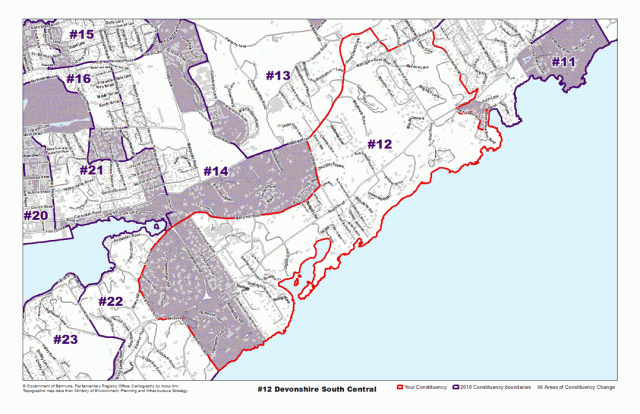 The areas Devonshire South Central compromises of, or is located by, include Point Finger Road, Berry Hill Road, Crow Lane, Lane Hill, Cavendish Road, Brighton Hill Road, Watlington Road East, South Road, Devonshire Bay Road, Southcourt Avenue and more. H. Anthony Richardson, C.A., M.A. is the Bermuda Progressive Labour Party’s Candidate for Constituency 12, Devonshire South Central. We believe Anthony’s candidacy represents COURAGE, COMMITMENT and CHARACTER. COURAGE – Anthony has taken a bold step to start his political career during Bermuda’s current political evolution. He has accepted the challenge of standing against a Party Leader in an area that has consistently voted for the UBP in every election since 1964. COMMITMENT – Anthony has consistently served Bermuda through his private and public service during the past 25 years. CHARACTER – Anthony is active in the church community and acts as a role model for all Bermudians through his involvement in various charities, the church and on a personal level. Anthony was born in Bermuda and grew up in St. George’s, attending East End Primary School. He then attended Warwick Academy and the Bermuda College before going overseas to Acadia University, where he earned a Bachelor’s degree in Business Administration. He has more than 20 years experience as a professional accountant, qualifying in 1990 as a Chartered Accountant after articling at the former Coopers and Lybrand. His tertiary education concluded with a Master of Arts Degree in Finance and Management from Webster University in 1995, awarded with distinction. Anthony points to his appointments as Accountant General of Bermuda, Vice President at Bank of Bermuda and CEO of the Bermuda Health Council as the highlights of his professional career. He also served as a lecturer at Bermuda College and a Police Officer, being awarded the Baton of Honor from his recruit class. Anthony currently serves in the community as Chairman of the Board of Directors of the First Church of God and the Bermuda Parents, Teachers Students Association, a member of the Price Control Commission and a guest presenter on the Hope and Good Cheer radio broadcast. His previous leadership roles include Chairman of the Bermuda Hospitals Board and the Bermuda Educators Council and serving on the Hospital Insurance Commission, YouthNet, Bermuda Football Association and the Golf Course Trustees of Bermuda. Anthony credits his success to his family – he is married to Holly and has 2 children – Jordyn (9) and Kallan (5). Craig believes that the OBA is seeking a future shaped by the minds of tomorrow, is grateful for the present, and mindful of our common past. Craig served as Leader of the BDA. Craig was born and raised in St David’s, attending St Georges Preparatory school and the Bermuda Institute. After obtaining a BSc in Industrial Psychology from Towson State University in Baltimore, Maryland in 1986, Craig went on to acquire retail management experience in a number of different arenas. Craig began his career by working for the MarketPlace Group where he was responsible for human resources, training and purchasing. Craig served as the General Manager of People’s Pharmacy for some ten years during which time he assisted the pharmacy to become one of the Island’s premier independently owned pharmacy. Prior to beginning his association with Esso Bermuda, Craig served as a Relationship Manager for Cable & Wireless. Craig currently runs Esso City Tigermarket, Collector’s Hill Esso and Warwick Esso. Craig and his wife Antoinette are members of Marsden First United Methodist Church and enjoy spending time with family and friends. They have four children and a Yorkshire terrier puppy. Craig’s hobbies include sports, travelling, boating, as well as tackling various DIY projects around the house.